Can I Upgrade Electrical Panel Without Permit? The electrical panel is the centre of electricity supply in a home or building. It is called several other names such as the distribution board and breaker panel. You can identify the electrical panel as a metal electrical service board, located outside the home, in the garage, or the utility room. It is a network of wires and switches. Most people are a bit familiar with the electrical panel of their home. They recognize it as where you go to switch the power on after tripping the breaker. Others may know nothing about the electrical panel and are quick to call on a professional electrician for help. Breaker panels usually last for as much as 25 to 40 years before needing any replacements or upgrades. However, the manner of use and appliances in the home can wear out the electrical panel faster. A home between 20 to 30 years old might require an upgrade. The electrical panel may still top out 60 to 100 amps which are low compared to newer homes. 200 amps are now more in use. These can range from several things like tripping lights, warm panel, burning outlets, and so on. Such electrical problems are signs of a fault in the breaker panel. They require the attention of a professional electrician as soon as possible. 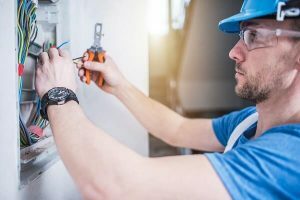 Upgrading the electrical panel with or without a permit. An electrical permit is important for any electrical work. This guarantees both customers and their insurance companies that the installations are safe and professionally done. You can install light fixtures and other minor electrical needs without a permit. In some States, a permit allows homeowners to take on the project of upgrading the electrical panel themselves. This is dangerous and inadvisable. As a homeowner, you may not understand the complexity of the electrical panel. It is not similar to other electrical installations, hence should only be handled by a licensed electrician. Unlike outlets, electrical panels always carry live electricity even when the breaker is shut off. Improper handling can lead to electric shocks, fire outbreak, loss of lives, and damage to appliances. An electrical technician knows of all these dangers and has knowledge and experience to work on the electrical panel. They guarantee you safe wiring that lasts for a long time. If you successfully upgrade the panel on your own, you would still miss out on installing new cables and an electrical meter. The licensed electrician will give you suggestions to save money on energy. They will also ensure that you know more about the local codes and the upgrade complies with current electrical regulations. A licensed electrician’s work will take less time’ precisely about 8 – 10 hours to complete. It will also pass electrical inspections. You should not perform any electrical wiring without a permit. Ensure that you have the experience and skill to do the job. If not, it is always wise to hire a professional electrician. This entry was posted in Wiring Articles. Bookmark the permalink.